Portland, Oregon – City of Roses. Roses grow phenomenally well here. We even have an International Rose Test Garden as part of our city parks, which is absolutely worth the trip in spring or even in parts of the summer if you are in town. Ladd’s Addition, a neighborhood on the eastside of Portland, boasts rose gardens sprinkled throughout. I love walking through this city in the spring and taking the time to smell the roses, literally! Roses are in practically every garden, every park, they are even planted on the side of the freeway. Roses are everywhere! I painted these designs in gouache on paper one sunny day in my backyard. The sky was a gorgeous hazy shade of blue, and the roses were open and fragrant. I just wanted to take this opportunity on launch day of this collection (which is always an exciting day for a designer!) to share with you some of the paintings that inspired the creation of Pretty Roses. 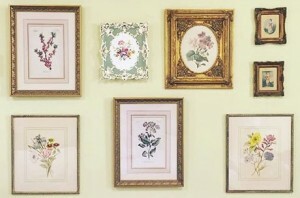 I liked the idea of adding a “frames” print because I collect ornate framed botanical pictures. Here are a few of my ornately framed botanical prints. Well, that’s it! Pretty straight forward concept: pretty flowers + pretty colors= pretty fabric. P.S. Here are a couple of my favorite kits that were created with Pretty Roses Fabric, all available from Connecting Threads. 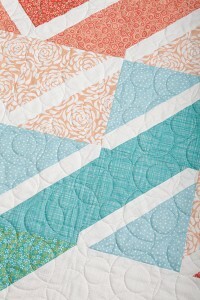 Close up of the Sew Radiant Quilt. Sew Radiant Quilt, designed by Quilt in a Day. I love the asymmetry of this design. The Rosarian Quilt, our cover shot! The Rosarian Quilt, designed by Mari Martin. I love it. The colours are so soft and the prints whimsical and modern.